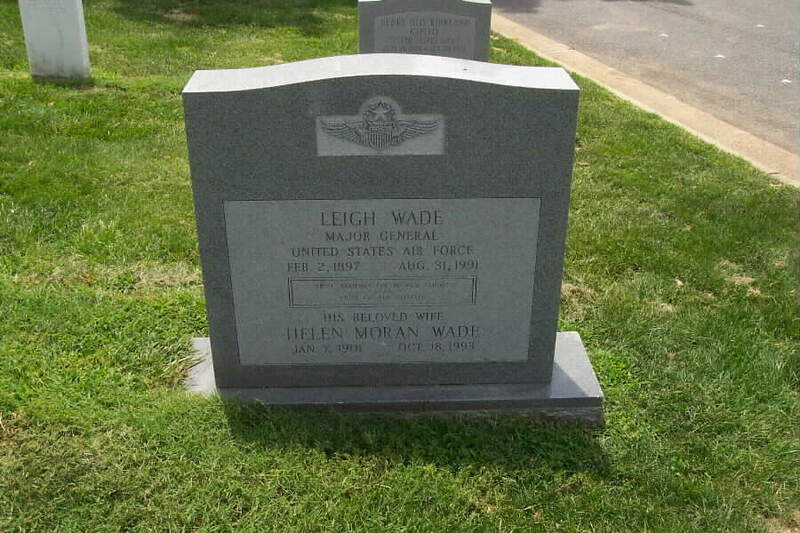 "Leigh Wade, a pioneer aviator who became a U.S. Air Force Major General, died August 31, 1991 at Belvoir Woods Health Care Center, Fort Belvoir, Virginia. He was 93 years old and lived in Washington, D.C. He entered the health facility in December. His wife said that he had been suffering recently from pneumonia. "In the pages of aviation history books, the youthful, rugged, jaunty Wade still flies. Known especially for his role in 1924, as an Army Lieutenant, in "the ultimate long-range pre-rocket flight," as one aviation historian, Frank Donovan, put it in his 1962 book "The Early Eagles." Oliver Stewart, in his 1958 book "First Flights," called the mission "in truth the first flight around the world" - although he made part of the trip by sea. For years, Eric Hodgins and F. Alexander Magoun wrote in "Sky High: The Story of Aviation," published in 1935, "England, France, Italy and the United States had cherished the idea of an air journey around the world," and by the 1920s "it was a possibility that skill, courage and determination might well translate into fact." In achieving it, the authors wrote, a group of Army aviators including Wade became "Magellans for the Air." "A native of Michigan, he was one of eight Army aviators who took off from Seattle to fly around the globe in four 2-winged, single-engine Douglas aircraft. The 175-day mission included totals of up to 363 hours of flying time per plane, sandwiched between stops in two dozen countries. With Wade at the controls of one aircraft, the Boston, the mission began at Seattle. It consisted of 73 segments of up to 830 miles each. The versatile planes could function as pontoon-mounted seaplanes or with landing wheels. Their itinerary took them, with many intermediate stops, up the Canadian and Alaskan coasts, on to Calcutta, to Brough in England, to Boston and then back to Seattle. An oil leak forced one plane down in Alaska, and its crew dropped out of the mission. During the remaining aviators' stopover in London, Wade, who was exhausted, fell asleep at a formal banquet and, the story goes, his British hosts were too kind to disturb him. On the flight from the Orkney Islands and Iceland, the Boston's oil pump gave out with Wade and a mechanic on board. They had to put down in the North Atlantic. A U.S. Cruiser came to their aid. They went on board, but the plane was wrecked in an attempt to take it on board too. Wade is said to have wept, but he and the mechanic rode off on the cruiser and later rejoined the mission from Nova Scotia, on board a replacement plane, the Boston II. The globe-circling ended with welcomes in cities across the U.S.
"The future General returned to civilian life later in the 1920s and was a test pilot and executive. He was back in uniform in World War II, during which he comanded an Army Air Base in Cuba. He retired from the U.S. Air Force in 1955. He is survived by his wife, the former Helen Moran, whom he married in 1941." Becoming a cadet in the aviation section of the Signal Corps in 1917, Wade received flight training from the Royal Canadian Air Force and in France. After serving as a flight instructor, in 1918 he made acceptance tests of warplanes at Paris. Assigned as a test pilot to the air service engineering division at McCook Field, Ohio, in 1919, he set an altitude record of 27,120 feet in 1921, and a three-man altitude record of 23,350 feet in 1922. In 1924, Wade was chosen to pilot the "Boston," one of four Douglas World Cruisers attempting the first round-the-world flight. The planes left Seattle, flew to Alaska and crossed the Pacific to the Orient. From India, they flew to the Middle East, Europe and England. Enroute to Iceland, the "Boston" was forced down on the Atlantic. Wade and his co-pilot later rejoined the flight in Nova Scotia in the "Boston II," which ended successfully at Seattle. Wade then became chief of the flight test branch at McCook field. In 1926 he joined Consolidated Aircraft Corporation as chief test pilot. During World War II, he served in the Army Air Forces Air Intelligence section, then with the 1st bomb group. Next he commanded Batista Field, Cuba, and later served with the 14th Air Force. After the war, he became air attaché to Greece iin 1949 and to Brazil in 1952, and served as chief of the air section on the joint Brazil-United States military commission until he retired as a major general in 1955. 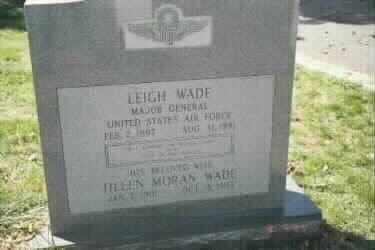 Leigh Wade passed away on October 31, 1991. Leigh Wade was born in Cassopolis, Mich., in 1896, and graduated from high school there in 1915. He enlisted in the National Guard in June 1916, and a year later became an aviation cadet. In December 1917, after graduating from flying school, he was rated a pilot and commissioned a first lieutenant in the Aviation Section of the Officers' Reserve Corps, with which he served continuously until March 1926, when he reverted to inactive status. General Wade then became an aircraft sales executive with Consolidated Aircraft, with which he worked in the United States and South America until 1941 and for which he was chief test pilot from 1928 to 1929. In March 1941, General Wade returned to active duty with the Air Corps as a major and was assigned to the Air Intelligence Section at Air Corps headquarters. In June 1941, he was transferred to the First Bomber Command at Mitchel Field, N.Y., where he served as assistant for plans and training. General Wade went to Cuba in August 1942, to command Batista Field. In May 1946, he was assigned to the 14th Air Force at Orlando, Fla., as operations officer and public information officer. In November 1948, General Wade received temporary duty at Air Force Headquarters. In July 1949, he became air attache at Athens, Greece. He was appointed air attache at Rio de Janeiro, Brazil, in May 1951, and in December 1952, became chief of the Air Section of the Joint Brazil-U.S. Military Commission also at Rio de Janeiro. General Wade was awarded the Distinguished Service Medal in 1925 for his services as pilot and supply officer of the U.S. Army Air Service around-the-world flight from April 6 to Sept. 28, 1924. He also has been awarded the Legion of Merit and many foreign awards. He is rated a command pilot. In 1925, General Wade received honorary master of science degrees from Tufts College and Norwich University.